It is time to rise from the ashes, literally. Now or never. The forces of destruction are all around us and coming from every direction: environmental catastrophe, domestic terrorism, political chaos, economic fragility, and a slowly loosening grip on what is left of democracy. We are seeing an apocalyptic wave of destruction burn before our very eyes, madness exploding in the uncertainty of everything we have ever known to be true. While Paradise is burning, the Media enthralls us with 24/7 news cycles of disaster, intrigue and controversy, relentless hypnotic messaging that blurs fact from propaganda, truth from fiction, tv drama from the news. There is nothing left of Paradise. It’s Lost. 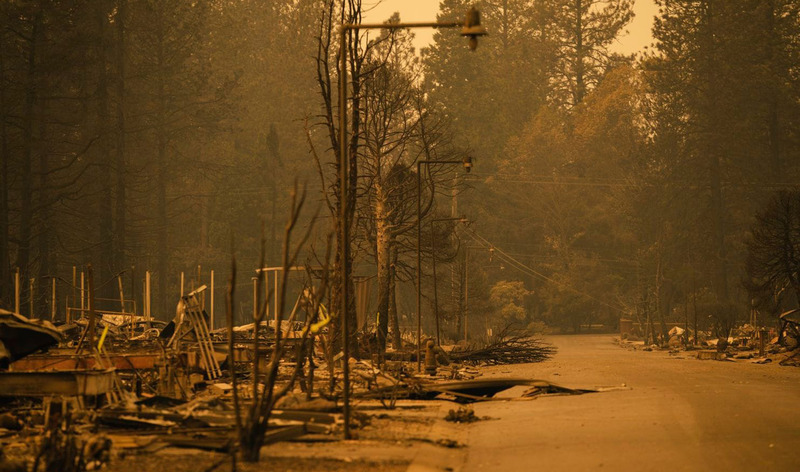 Hundreds missing in a terrible inferno that raged in the Central California droughtland, a massive funeral pyre ignited by environmental neglect that will surely bring the earth to a boil in a matter of decades if not years. It is time we collectively rise up from this ignorance or count the human race out. Is there still hope? Where there is human spirit there is hope, no matter how far we may fall, and we have fallen very, very far into a deepening abyss throughout the past two years. XTREME TRUMPology has penetrated us like a viral disease, infecting and poisoning the body politic. As California burns in a living Hell we can barely fathom, the horror of fabricated, self-inflicted drama rears itself like an angry joke: imaginary lethal Caravans of violent immigrants on the March, fear of rain, a sycophant body builder directing the Department of Justice, a CNN reporter molesting an intern, Democrats desecrating the sacred act of voting, and on and on it goes. Paradise is Lost and this is what consumes us in the everyday madness of Life in America. Despite the devastation of charred ruins in California, you can feel a turning, a welling up, a sense of hope and possibility. And in these times of post-truth… this is real. You can see it in the eyes of high school students, beaten down by serial mass killings, outraged and defiant against the NRA. You can see it in the words of French President Emmanuel Macron speaking out against Nationalism. And most of all, you can see it in the determined faces of newly elected members of Congress, particularly women who represent our last line of defense against the seemingly unstoppable TRUMPism. In the wake of Paradise Lost, there is a raw hope of humanity rising.